The solar industry and the state’s utilities disagree over just what impact net metering has on electricity rates, utility costs and grid operations. AB-327, the controversial California bill that tackles residential electricity rate reform and solar net metering policy in one fell swoop, was approved by the state Senate on Sep 9, 2013 and the Senate revisions passed the Assembly on Sep 12. Gov. Jerry Brown has indicated his support. Utilities have long argued that net metering doesn’t adequately compensate them for the costs they face in supplying solar-equipped customers with grid power while the sun isn’t shining. Too many net-metered customers could force utilities to raise rates on all non-solar customers, and eventually lead to a death spiral for utilities that end up paying out more than they’re taking in from their customer base. They argue that poor rate payers who cannot afford solar end up subsidizing rich home owners who have the capital to invest in roof top systems. Solar advocates, by contrast, point to studies that show that net metering of distributed solar power is a net asset, rather than a liability, to the grid at large. Those benefits can stretch from lowering the average cost of electricity for all users, to helping meet the state’s aggressive goals to supply more and more of its power from renewable resources in the coming years. Under current California low, Net Energy Metering (NEM) allows solar owners to roll their meters backward for every kilowatt-hour they send to the grid (up to the point where their bills zero out). The return they get on the electricity they generate is the same retail rate they pay for what they consume. Since the top electricity tiers are very expensive, solar can be very competitive. NEM for California's IOU's is currently capped at 5%. Utilities and the CPUC have disagreed how the 5% should be calculated. The California Solar Initiative was structured when it was launched in 2007 as a ten-step incentive program, and we are now at step ten. There is not another incentive program that will replace that. ABx 1 - During the energy crisis, the Legislature passed ABx1 (Keeley, 2001) to protect California ratepayers from rampant price fluctuations due to a dysfunctional wholesale electricity market. ABx1 1 authorized the Department of Water Resources (DWR) to issue revenue bonds to purchase power at such prices the department deemed appropriate, on behalf of the cash-strapped investor-owned utilities (IOUs) which couldn't keep up with the volatile wholesale prices. Among other stabilizing efforts, ABx1 1 included a provision that prohibited the CPUC from increasing rates for usage under 130% of baseline(tiers 1 and 2) until DWR bond charges were paid off. Those charges continue. Because rates in the two lowest tiers were frozen, increased costs for generation, distribution, transmission and new programs created by the Legislature and the CPUC, have been disproportionately borne by those customers whose electricity usage falls in the upper tiers. SB 695 - In 2009 SB 695 (Kehoe) was signed into law as an urgency statute. Among its provisions, the bill removed the freeze on tier 1 and tier 2 rates and intended to allow for gradual rate increases through 2018 at which time the caps for those increases would sunset. Different formulas were created for Non-CARE customers and CARE enrollees. As a consequence, beginning Jan 1, 2010, the CPUC could grant increases in rates charged to non-CARE residential customers for tier 1 and 2 rates by the annual percentage change in the Consumer Price Index from the prior year plus one percent, but not less than three percent or more than five percent per year. Increases in tier 1 and 2 rates for the residential CARE program were statutorily tied to annual cost of living adjustments for CalWork's benefits not to exceed three percent per year. The IOUs were also permitted to add a third tier of rates for CARE enrollees. Prior to SB 695, CARE enrollees were subject to charges under only the first two rate tiers. The provisions of SB 695 resulted in three to five percent increases on tier 1 and 2 rates for non-CARE customers and resulted in a commensurate decrease in rates for tiers 3, 4, and 5. The rates for CARE enrollees in tiers 1 and 2 have not increased due to the suspension of COLAs for the CalWork's program, except for the addition of a third tier for CARE enrollees in the PG&E service territory. The rate adjustments, overall, were revenue neutral to the IOUs. In PG&E service territory the gap between tier 1 and tier 5 decreased by 17 cents, but tier 5 was still 2.65 times higher and 21.88 cents per KWh more.
. In the SDG&E rates which took effect on Sep 1 2013, the rates for tiers 3 and 4 increased more than 20% going to more than $0.34 per kWh in tier 3 and $0.36 in tier 4. A recent notice to customers from SDG&E's president reported the expected impacts - if a bill is now $250, then it will increase to $325 in September. A $100 electric bill will rise to $115. .
SB 743 (Steinberg/Padilla) - modifies the index to which CARE enrollee rate increases are tied to strike CalWorks and add the Consumer Price Index. The rates for CARE customers in tiers 1 and 2 have not increased due to the suspension of COLAs for the CalWorks program. Consequently, assistance to CARE customers is far greater than intended. AB 1755 (Perea, 2012) - authorized the CPUC to approve a fixed charge for residential customers beyond the statutory caps on rate increases for Tier 1 and Tier 2 customers. Status: Senate Floor Inactive File. CARE - California Alternate Rates for Energy - Program to discount rates for low-income gas and electric customers defined as those with incomes no greater than 200% of the federal poverty level and permits no more than three rate tiers. Economic Efficiency - Obtaining maximum consumer satisfaction from available resources. In the rate design context, economic efficiency is achieved when pricing reflects the marginal cost of generating and delivering electricity, including externalities. Externality - A cost or benefit that is not included in the market price of a good because it's not included in the supply price or the demand price. Pollution is an example of an externality cost if producers aren't the ones who suffer from pollution damages. Externality is one type of market failure that causes inefficiency. Fixed Charges - In the spring of 2010 PG&E, as part of its triennial rate case, PG&E applied to the CPUC to establish a fixed customer charge of $3 for all non-CARE residential customers, and $2.40 for all CARE enrollees. Although the CPUC recognized a growing disparity in rates, they rejected the charge on legal and policy grounds and characterized it as "the most significant change in residential electric rate design in the last decade." Legally the CPUC opined that the statutory caps on rate increases for tier 1 and 2 residential customers included any new or increased fixed rate charges. They specifically found that the commission was "prohibited by law from approving PG&E's customer charge to the extent the total bill impacts exceed these statutory limitations on baseline rate increases.". Sacramento Municipal Utility District imposed, for the first time, a fixed charge of $10 per residential customer in 2012, which was increased to $12 this year, and there are plans increase the charge $2 per year for 3 to 4 years. Why the tool is critical now is not readily apparent; the costs of electric service now labeled as "fixed" are not new. The IOUs argue that the lack of a fixed charge has caused high usage customers to pay unfairly high bills and created an artificially attractive market for customer-owned generation because the highest tier rates are far in excess of cost. A fixed charge would bring down upper tier rates but the lack of a fixed charge didn't exacerbate the upper tier rates, the rate freeze on tier 1 and 2 customers is largely to blame. GRC - General Rate Case - Proceedings currently take place every three years before the CPUC. The GRC will set the base revenue requirements for electric/gas operations. These base revenues recover the utility's operation and maintenance expenses, depreciation, and taxes and provide a return on invested capital. Market Rate Net Metering - The user's energy use is priced dynamically according to some function of wholesale electric prices. The users' meters are programmed remotely to calculate the value and are read remotely. Net metering applies such variable pricing to excess power produced by a qualifying systems. Marginal Cost - The cost of providing one additional unit of a good or service. In the electric utility context there are several types of marginal costs – energy, generation capacity, transmission capacity, and distribution capacity. The change in utility costs resulting from an additional customer or additional use of energy or capacity, or the change in costs related to a change in output. The CPUC uses marginal costs in allocating the utility’s revenue requirement to customer classes, and as reference points in rate design. In the California ratemaking context, short-run marginal costs would reflect current market conditions (e.g., over- or under- capacity situations), while long-run marginal costs would include the entire cost of new facilities. NEM - Net Energy Metering - An electricity policy for consumers who own renewable energy facilities (such as wind power and solar power), and allows them to use generation whenever needed, instead of just when generated. The rules vary significantly from place to place: if net metering is available, if and how long you can keep your banked credits, and how much the credits are worth (retail/wholesale). 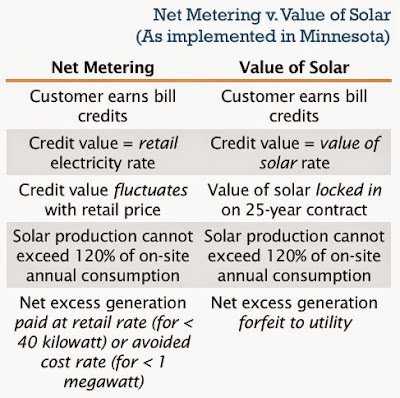 Most net metering laws involve monthly roll over of kWh credits, a small monthly connection fee, require monthly payment of deficits (i.e. normal electric bill), and annual settlement of any residual credit. The treatment of annual excess generation ranges from lost, to compensation at avoided cost, to compensation at retail rate. 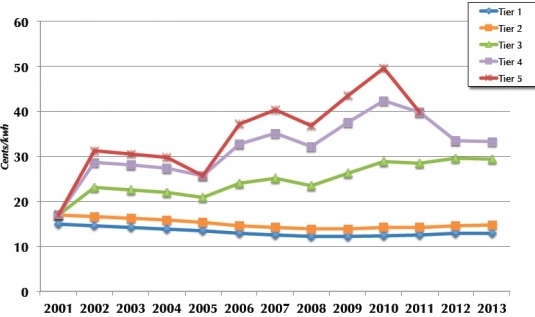 In California, excess generation is rolled over indefinitely. 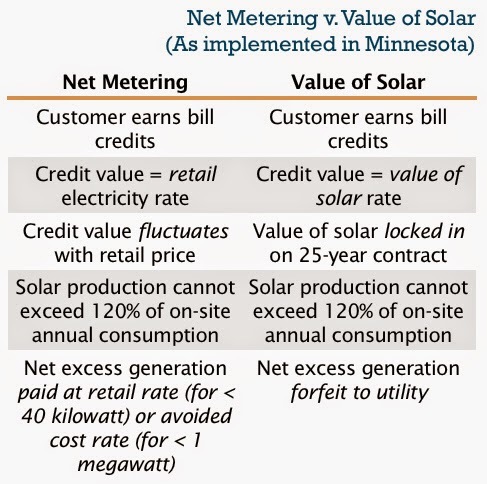 Net Metering - which is always at retail, and which is not technically compensation, although it may become compensation if there is excess generation and payments are allowed by the utility. Net metering only requires one meter. A feed-in tariff requires two. Power Purchase Agreement (PPA) - compensation which is generally below retail, also known as a "Standard Offer Program", and can be above retail, particularly in the case of solar, which tends to be generated close to peak demand. Net Purchase and Sale - A different method of providing power to the electricity grid that does not offer the price symmetry of net metering, making this system a lot less profitable for home users of small renewable electricity systems. Rate Cost Components: In California, rates are unbundled into generation, distribution, and transmission components based on key costdrivers for each component. Generation Costs: Costs related to generating power to produce electricity. Typically defined in terms of capacity costs (e.g., $100/kW) and energy costs ($0.08/kWh). Transmission Costs: Costs associated with the transmission system for moving power long-distances or at high voltage, regulated primarily by FERC. Tier Rates - Residential electric rates in California's IOU territories are generally designed in a four or five-tiered structure based on the customer's quantity of electricity usage. Within prescribed usage tiers, the amount of electricity consumed is priced at increasing per-unit rates. Tier 1 is the customer's "baseline" - the level deemed necessary to supply a significant portion of the reasonable energy needs of the average residential customer; Tier 2 applies to usage between the baseline and 130% of that amount. Baseline levels vary depending on the climate of the region (e.g. hotter regions have a higher baseline). This multi-tiered conservation pricing structure grew out of the energy crisis. Prior to that time, a two-tier pricing structure was common. TOU - Time-of-Use Rates - (See my post Dynamic Pricing) With time-based rates, utilities charge different prices based on the time of day electricity is used. The different charges should reflect the ups and downs of wholesale power prices due to supply and demand. In hot climates, power is typically most expensive late summer afternoons and early evening hours, when heavy air-conditioning use causes spikes in electricity use. With time-of-use or TOU rates, energy charges are higher during the hours of peak demand but lower at all other times. This creates financial incentives for consumers to shift energy use to the less expensive off-peak hours, which relieves the strain on energy supplies. However, customers in the hot climates cannot shift air conditioning use to another time of the day like they can their laundry. Peak demand dictates the size of generators, transmission lines, transformers and circuit breakers for utilities even if that amount lasts just a few hours a day. Power generation which is able to quickly ramp-up for peak demand often uses more expensive fuels, is less efficient and has higher marginal carbon emissions. Most natural gas plants in California's fleet are older and lack the fast-start technology, consequently they must idle until needed to meet peak demand and in that stand-by mode continue to produce emissions. TOU rates are advocated by many environmental groups who argue that the rates help rein in peak demand and avoid building new power plants. Some electric utilities similarly advocate for TOU because the rate reflects the principle of cost-causation and requires customers to make decisions about energy use when it has the highest cost and encourage customers to shift significant amounts of energy use away from the peak hours when power is most costly. TOU metering is a significant issue for solar power systems because they produce energy during the daytime peak-price period, and produce little or no power during the night period, when price is low. When this is the case, the effective output of a solar panel is increased, as more electricity can be consumed than is produced. In Nov 2011, the CPUC approved a decision imposing mandatory time-variant pricing programs on small business customers of PG&E in two stages, beginning in November 2012. In Dec 2012, the CPUC approved a decision imposing mandatory time-variant pricing programs on small business customers of SDG&E starting in November 2014, with an optional program commencing in November 2013. Value of solar is not like net metering, where producing energy reduces your electricity bill just like turning off a light. 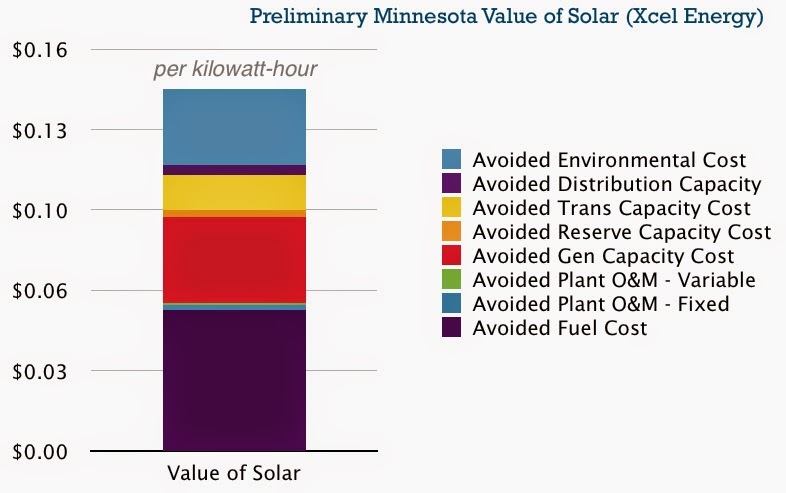 As adopted, Minnesota’s value of solar formula includes all of the basic components of the theoretical policy, however, the overall adopted policy had some good elements that were lost in the legislative process. Utilities argue: "An electricity bill’s per-kilowatt-hour charge has three primary portions, the generation portion of the charge, the amount for that kilowatt-hour to actually be generated, the transmission portion of the charge, the part you pay for the use, construction, maintenance, etc., of the transmission line between the generation station and the local substation, and the distribution charge that is very similar to the transmission portion but is for the distribution system that actually allows the electricity to be delivered. NEM customers avoid paying non-generation components of rates for the portion of their electricity." Requires the California Public Utilities Commission (PUC), when it approves changes to electric service rates charged to residential customers, to determine that the changes are reasonable, including that the changes are necessary in order to ensure that the rates paid by residential customers are fair, equitable, and reflect the costs to serve those customers. Requires PUC to consider specified principles in approving any changes to electric service rates. Requires PUC to report to the Legislature its findings and recommendations relating to tiered residential electric service rates in a specified rulemaking by January 31, 2014. Recasts and revises limitations on electric and natural gas service rates of residential customers, including the rate increase limitations applicable to electric service provided to California Alternate Rates for Energy (CARE) customers. Require the IOUs to provide annual distribution plans and for the PUC to approve those plans, if it finds them reasonable, in each IOU General Rate Case. Revise the current Net Energy Metering (NEM) statute to specify the maximum program capacity for customers in IOU service areas, require the PUC to develop a new NEM program by July 2015 and establish a transition to the new NEM program by 2017. The new NEM program is to be based on electrical system costs and benefits to nonparticipating ratepayers and remove both the total system capacity cap and the one megawatt project size limit. Existing NEM customers will be transitions no later than December 2020 to the new NEM. AB 327, as amended, calls for the CPUC to create a new study to serve as the basis for the state’s big three investor-owned utilities to develop brand-new net metering programs by the end of 2015, and instructs them to put those new programs in place in 2017. The bill states "There shall be no limitation on the number of new eligible customer-generators entitled to receive service pursuant to the standard contract or tariff after January 1, 2017" This means the current 5% cap for NEM of aggregate consumer demand will be eliminated. The three IOUs defined aggregate consumer demand as “coincident” peak demand. Renewables advocates argue that “non-coincident” peak demand should be used. Coincident peak demand is the designated period when all sectors (residential, commercial and industrial) reach their maximum electricity consumption and the state’s consumption peaks. Non-coincident peak demand is the sum of the individual peaking demands of all customers in the three sectors. Residential peak is typically late afternoon, commercial peak is early mid afternoon, and industrial peak can be at night. That sum of all peaks is greater than the total peak demand at any one time of the day. When the installed DG capacity eligible for NEM divided by the peak demand gets to five percent, the utilities are off the hook. So they want that bottom number to be smaller. Renewables advocates want just the opposite because the larger number keeps what one solar advocate called their “backbone” incentive in place. Provide the PUC with authority to require IOUs to procure renewable energy generation above that which is required in the 33% Renewable Portfolio Standard. Authorize the PUC to approved fixed monthly charges no greater than $10 for residential customers and $5 for low-income customers beginning in 2016. Specify discounts for low-income customers are not to exceed 30% to 35% of the average non-low-income customer. AB 327 doesn’t change rates itself. “Rate reform is going to be decided by the CPUC. All that AB 327 does is give the CPUC some more tools in that process. Establish that by 2018 the default rate schedule for residential customers shall be based on Time of Use and establishes provisions to protect senior or other vulnerable customers, in hot climate zones, from unreasonable hardship. Add technical amendments to the provisions related to residential electricity rate reform. PUC Residential Rate Design Proceeding (R.12-06-013) is underway. On June 28, 2012, PUC initiated a proceeding to examine current residential electric rate design, including the tier structure in effect for residential customers, the state of time variant and dynamic pricing, potential pathways from tiers to time variant and dynamic pricing, and preferable residential rate design. Incentives for Conservation & Energy Efficiency - Large fixed charges can undermine customer incentives to reduce consumption and undertake energy efficiency improvements. For example, if you used 500 kilowatt-hours of electricity per month (about average for a California customer) and your rate was 15 cents for each of those kilowatt-hours, it might take two years to recover your investment in new energy efficient lighting. But if the utility charged you a $25 fixed charge per month, and reduced your rate to 10 cents per kilowatt hour to compensate, it would now take three years for that same energy efficiency investment to pay back because you cannot avoid that $25 charge and you would have to save 50 percent more kilowatt hours to recover your investment. Similar impacts would occur for consumers considering the installation of rooftop solar. Reduced GHG - SB 327 makes it clear NEM will be additive to the state's 33% RPS goal for renewable energy. Cost Calculation Methodology - Utilities' "all-in cost" is what energy experts call the "avoided cost." An avoided-cost analysis does not consider longer-term impacts. It is very hard for traditional utility people to see rooftop solar as a resource because they do not control it. As a result, they don’t consider it a resource; they think of it as opportunity energy, so they are not willing to consider cumulative impacts. In the absence of real data, utilities assume a simplistic binomial distribution of costs and benefits. The straw man is that solar either avoids transmission and distribution costs or it doesn’t, and the conclusion is that since it doesn’t, because PV has to be connected to the grid, therefore all the costs apply to solar and none are avoided. Will there will be worst-case days with both high peak demand and high cloud cover? I'd say "no" for a California summer heat wave, but I'm not responsible for maintaining the grid. Maybe a giant wildfire blots out the sun? In addition, economics change based on PV penetration. Enough solar on the grid will collapse peak hour demand. That has already happened in Germany. When high peak demand falls then the spread between the wholesale cost of midday power and late night power goes away. The most expensive power will be found just before solar kicks in and right after it goes away. In that potential future case, end-user solar would be sending relatively low value electricity to the grid and taking back more expensive. Stranded Costs - Utilities argue "An electricity bill’s per-kilowatt-hour charge has three primary portions, the generation portion of the charge, the amount for that kilowatt-hour to actually be generated, the transmission portion of the charge, the part you pay for the use, construction, maintenance, etc., of the transmission line between the generation station and the local substation, and the distribution charge that is very similar to the transmission portion but is for the distribution system that actually allows the electricity to be delivered. NEM customers avoid paying non-generation components of rates for the portion of their electricity." Unfair Upper Tiers - If a family can't buy or lease solar to shave the tier 3 and 4 electricity rates off of their bill, and if they don't qualify for enrollment in the CARE program, the cost of electricity, particularly in hot climates, can be a tremendous burden. Legislative Rate Making - There is little disagreement between that the indices and freezes on tier 1 and 2 residential rates must be eliminated and that any modification for those rates must be gradual so as to prevent ratepayer shock. But should the Legislature provide a framework for rate design to reflect and protect its priorities? Some argue that restrictions in statute amount to "legislative ratemaking"
Equity - Utilities argue the beneficiaries of net metering are relatively rich home owners, while relatively poor rate payers who cannot afford to install solar or do not own their own homes have to support more fixed costs. Time Lag in Net Metering Contracts - Under existing law, net metering would be suspended completely as of 2014, AB 327 removes that suspension. Utilities and the solar industry have been working under a deadline imposed by the CPUC, which would force net metering programs to cease as of the end of 2014. AB 327, as currently amended, would put that worry to rest. Under current law, there are no grandfathering protections at all for existing net metering customers. Everything under this is additive. These are all additional protections that nobody had before. Impact on Current Net Metering Contracts - It was feared AB 327 would subject today’s existing net metering contracts to review and potential rewriting, as the CPUC comes up with a new net metering regime. That led some groups to decry the bill as an attempt to undercut their investment in solar. While that doesn’t change the fact that existing net metering contracts will be subject to change, it does address the concern that the previous version of the bill was “creating a lag time of uncertainty as the market waited for the new rules. Net Metering Cap - Several years ago, the CPUC extended the cap for net metering from 2.5 percent to 5 percent of each IOU's nameplate capacity, but there’s been a longstanding dispute about how the cap should be calculated. Once the total number of customers signed up for net metering exceeded that cap, in terms of their kilowatt contribution to their utility’s total power mix, new customers would have been excluded. AB327 removes all legal uncertainty, and makes clear how the cap is calculated. As amended,, it sets clear figures for when each utility will reach that cap. That will either come as of Dec 31, 2016, or at the following capacities, whichever come first: 607 megawatts for SDG&E; 2,240 megawatts for SCE; and 2,409 megawatts for PG&E. Consumer Backlash to TOU Rates - The impacts of TOU rates would be especially felt by inland climates where air conditioning use is the highest and drives peak demand in the state. if not managed well, the imposition of mandatory TOU rates on customers will result in a significant customer revolt. Even with effective notice and education of customers about how to manage TOU rates, the inland regions of California will be hit the hardest due to their reliance on air conditioning during the summer months. SMUD announced its TOU rate structure this year but customers will not be switched to TOU until 2018. To ensure that customers have adequate notice and education and to gain customer acceptance, delay default TOU and permit mandatory TOU with bill protection beginning in 2020. Low Income Incentives - Because lower rates tend to encourage greater electricity consumption, should assistance for low-income households be offered as a fixed monthly credit, similar to food stamps, rather than as a rate discount? Rates should encourage economically efficient decision-making. The CPUC initiated a rulemaking on policy guidance for rate design in the summer of 2012 (R.12-06-013). They intend to consider how the state's energy policy goals for 2020 are affected by retail rate design and how rate design policies can and should be used to meet long-term climate and energy policy goals in an effort to align rates with policy objectives. More specifically, the proceeding will examine "whether the current tier structure continues to support the underlying statewide-energy goals facilitates the development of customer-friendly technologies, and whether the rates result in inequitable treatment across customers and customer classes." DRA - Division of Ratepayer Advocates San Francisco - A California state agency whose statutory mission is to obtain the lowest possible rate for service consistent with reliable and safe service levels. In fulfilling this goal, DRA also advocates for customer and environmental protections. Financial Impacts of Net-Metered PV on Utilities and Ratepayers: A Scoping Study of Two Prototypical U.S. Utilities - Satchwell, Andrew, Andrew D. Mills, Galen L. Barbose, - Lawrence Berkeley National Lab (LBL) - September 2014 A scoping analysis to quantify the financial impacts of customer-sited PV on utility shareholders and ratepayers and to assess the potential efficacy of various options for mitigating those impacts.The analysis relied on a pro-forma utility financial model that LBL previously developed for the purpose of analyzing utility shareholder and ratepayer impacts of utility-sponsored energy efficiency programs.The findings from this scoping study point towards several high-level policy implications. First, even at 10% PV penetration levels, which are substantially higher than exist today, the impact of customer-sited PV on average retail rates may be relatively modest (at least from the perspective of all ratepayers, in aggregate. At a minimum, the magnitude of the rate impacts estimated within our analysis suggest that, in many cases, utilities and regulators may have sufficient time to address concerns about the rate impacts of PV in a measured and deliberate manner. Second and by comparison, the impacts of customer-sited PV on utility shareholder profitability are potentially much more pronounced, though they are highly dependent upon the specifics of the utility operating and regulatory environment, and therefore warrant utility-specific analysis. Finally, LBL found that the shareholder (and, to a lesser extent,ratepayer) impacts of customer-sited PV may be mitigated through various “incremental” changes to utility business or regulatory models, though the potential efficacy of those measures varies considerably depending upon both their design and upon the specific utility circumstances. Importantly, however, these mitigation strategies entail tradeoffs – either between ratepayers and shareholders or among competing policy objectives – which may ultimately necessitate resolution within the context of broader policy- and rate-making processes, rather than on a stand-alone basis. continued efforts to improve the methods and data required to develop reliable and actionable estimates of the avoided costs of customer-sited PV. Free the Grid 2012 - policy guide that grades all 50 states on two key renewable energy programs: net metering and interconnection procedures. AB-327 Electricity: natural gas: rates: net energy metering: California Renewables Portfolio Standard Program. DRA's Presentation on Rate Design Basics.